Unlike the Best Supporting Actress winners for the same decade, here we have some quality contenders vying for the title. In the end, though, it all comes down to the bad guys. Once again: in attempting to determine the best of the best when it comes to performances, I must limit myself to considering the men who took home an Academy Award for Best Supporting Actor. So it doesn’t matter if you think Jake Gyllenhaal was robbed–we’ll have that debate another day. Even Clooney acknowledged that he won here because he wasn’t going to win Best Director for Good Night and Good Luck. So the Oscar wasn’t for the performance as much as it was a thanks for all the amazing work he did that year. 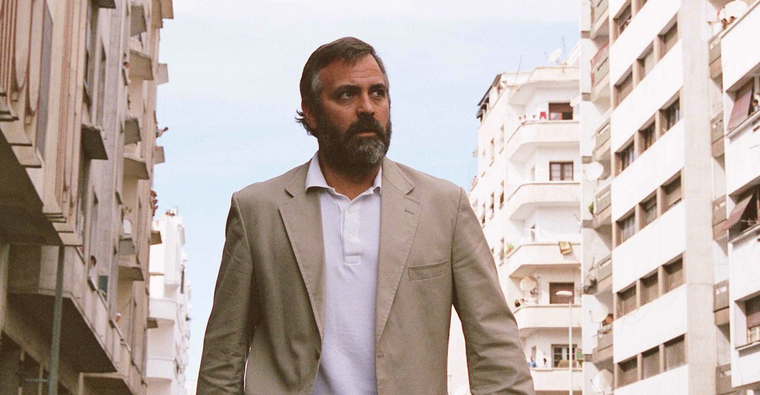 Clooney did put a lot into the part of Bob Barnes, a CIA scapegoat caught up in high-stakes political games in Iran–he even wrecked his back filming a torture scene–but not enough to justify the win. Should have won in 2005: Jake Gyllenhaal was more deserving for his role as one half of the gay cowboy couple at the heart of Brokeback Mountain. 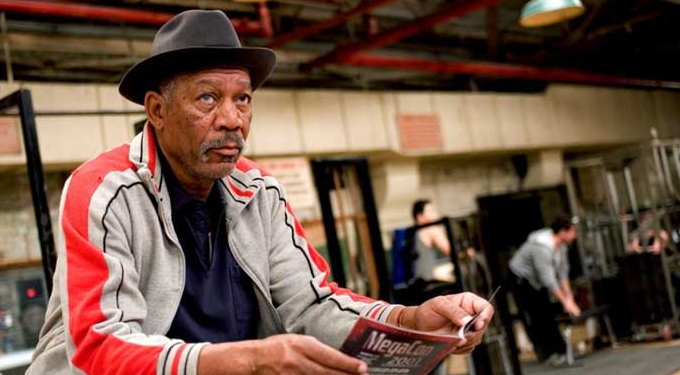 Morgan Freeman is a terrific actor, but this was more of a career achievement award than anything else. If you don’t want to call it a career achievement award, think of it as a make-good for not giving Morgan Freeman an Oscar for his work in The Shawshank Redemption. But no matter how you slice it, his performance here just wasn’t Oscar-worthy. Which of course means there’s nowhere to put it but down here. Should have won in 2004: Thomas Haden Church and Alan Alda had buzz that year for their performances as, respectively, a ne’er-do-well friend in Sideways and an aggressive senator in The Aviator. In the end, I would have given it to Clive Owen’s cuckolded doctor in Closer instead. 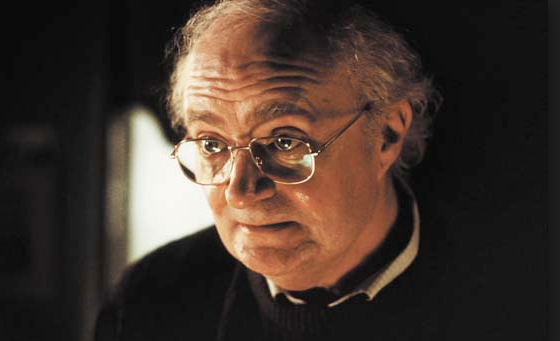 Jim Broadbent was very sweet and heartfelt as the husband watching his wife–a brilliant and fiercely independent write–lose her mind to Alzheimer’s in Iris. But even though Broadbent captures the pain of watching someone you love slip away from you, it’s another performance that just isn’t Oscar-worthy at the end of the day. Should have won in 2001: Not only was McKellen’s performance in The Lord of the Rings: The Fellowship of the Rings better, it has had a significantly higher pop cultural impact. While you could say that Alan Arkin’s endearing portrayal of the grumpy grandpa in Little Miss Sunshine steals the movie, it wouldn’t quite be enough to lift him any higher than this. I would also point out that little Abigail Breslin ultimately stole the movie anyway (she also gave the movie its heart and soul). He’s basically the stereotypical guy who yells at kids to get off his lawn in movie form. Still, Arkin is commendable for giving a fusty old man something approaching a genuine heart (albeit a scabby one) in the first place, but all the movie really asks him to do is be cranky. In a less competitive field, he’d be more of a player. As it is, this is where he belongs. Should have won in 2006: Some argue that Eddie Murphy should have won for Dreamgirls, a loss frequently blamed on his other movie from 2006: Norbit–a movie now synonymous with an actor screwing up his Oscar chances with a lowest-common-denominator comedy. But even though I hate The Departed, I think teaming with Scorsese brought out some great, unexpected work from Jack Nicholson. I go with Nicholson, who wasn’t even nominated. 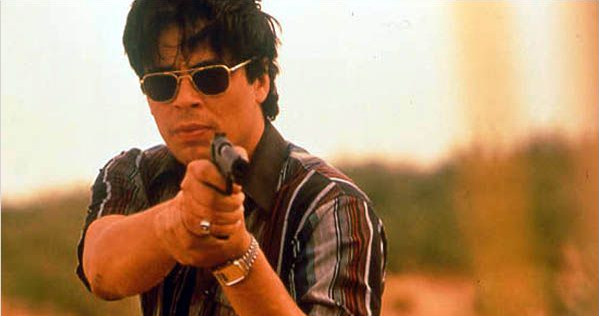 Benicio Del Toro was good in Traffic as a Mexican cop dealing with crime and corruption involving the drug trade along the border, but this is one of those cases where the performance completely faded from my memory over time. I only remembered thinking that his performance had been overpraised by far. A refresher courtesy of YouTube reveals a solid enough performance (certainly worthy of middling placement in the ranking), but points have to be taken away for being so forgettable. Should have won in 2000: You know who I do remember? Albert Finney as Erin Brockovich‘s put-upon boss. Joaquin Phoenix as Gladiator‘s deeply vexed, treacherous Commodus. Heck, I even remember Willem Dafoe’s creepy Nosferatu from Shadow of the Vampire and Jeff Bridges’ sandwich-loving president in The Contender. So while Del Toro clearly did all right against the other winning performances from this decade, any one of his fellow nominees would probably have been more worthy. OK, not Jeff Bridges. I’d have gone with Albert Finney. 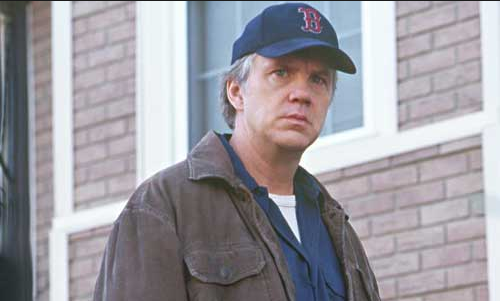 I always thought Robbins’ performance got outshone by Sean Penn, Laura Linney, and Marcia Gay Harden in Mystic River, but he was very good as Dave Boyle, one-third of a couple of old friends who get reunited after one of their daughters is murdered. The three friends suffered an incredible trauma as kids, causing them to sort of drift apart as they grew up, and Boyle was the one who never quite managed to put his life back together. Or at least he’s the one who managed it the least. Should have won in 2003: Robbins deserved it. This is probably the performance people are least likely to remember on this list. The fact that no one really remembers the movie doesn’t help, I’m sure. 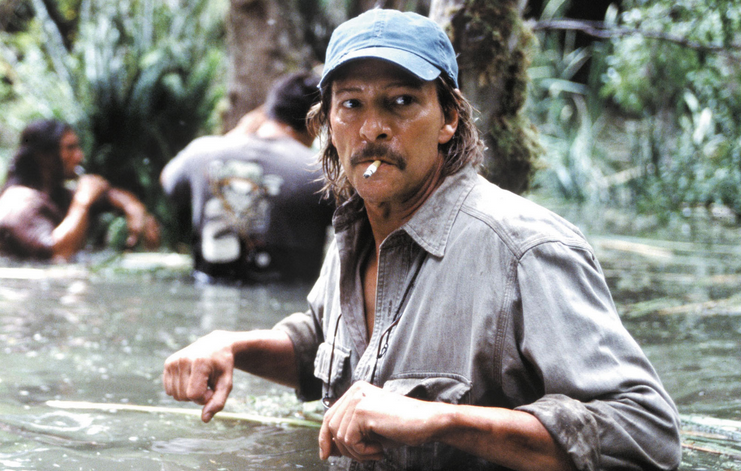 But Chris Cooper was genuinely good as John Laroche, an eccentric orchid enthusiast willing to do anything to get his orchid fixes–as well as providing an unlikely romantic fixation for Meryl Streep’s journalist. For those who don’t remember, Adaptation is a meta-adaptation of Susan Orlean’s nonfiction bestseller The Orchid Thief. Cooper and costar Meryl Streep managed to sell the source book’s complex themes of obsession and passion. Should have won in 2002: Cooper earned the win. You know how they say bad guys have more fun? 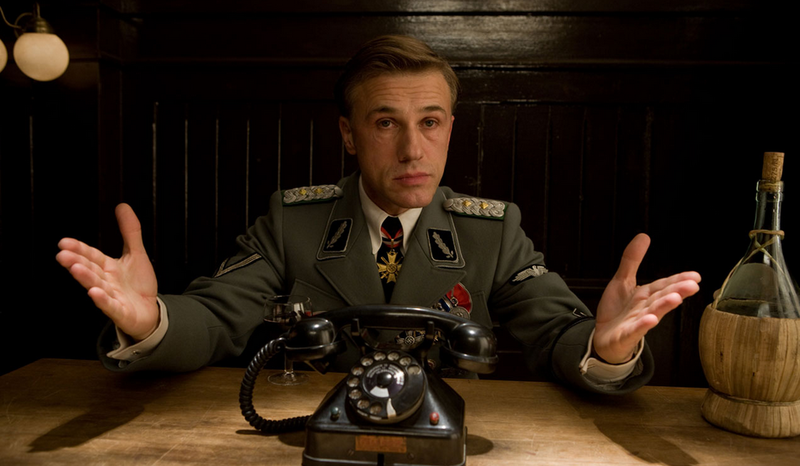 Christoph Waltz gave a deliriously villainous turn as depraved Nazi Hans Landa in Inglourious Basterds. Full disclosure: I absolutely hated this movie. But there can be no denying Waltz gave a brilliant performance. Hans Landa is something of a cartoon, but that doesn’t count against him (a realistic villain would not have suited Quentin Tarantino’s aesthetic at all). Indeed, in a movie chock full of depraved actions and delirious twists, Waltz’s storyline is the only one that comes off as entertaining to my mind. When he isn’t onscreen you’re wondering when he’ll be back. Should have won in 2009: Waltz earned every award he won, even if the movie was awful in my opinion. I’m scared to even talk about Javier Bardem’s haunting portrayal of violent, depraved, merciless hitman Anton Chigurh. 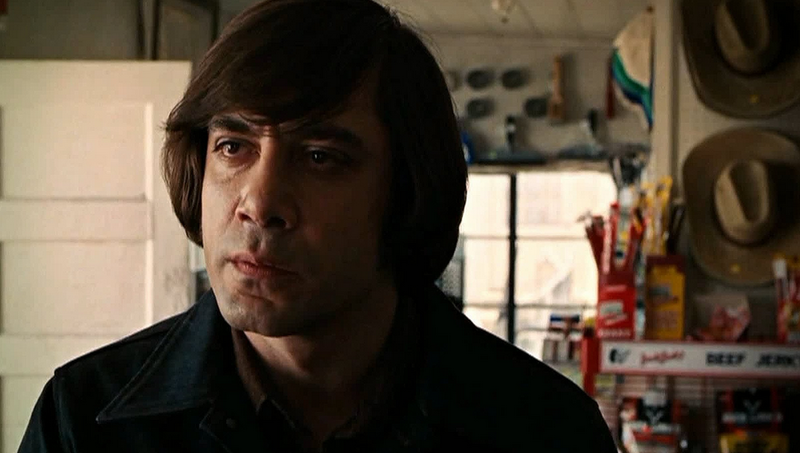 With his dated clothing and ridiculous page-boy haircut, Chigurh should have seemed laughable. Instead, Bardem made him a figure of sociopathic menace no one would dare laugh at. Ever. He doesn’t have the slithering evil of Hannibal Lector, but it’s no exaggeration to say that Bardem’s performance ranks with Anthony Hopkins’ as one of the all-time great villains. And unlike the other two bad guys in the top three here, Chigurh is somewhat realistic, not cartoonish. OK, let’s stop talking about him. I’m not superstitious at all, but this guy is like the bogeyman. And you do not want the bogeyman showing up at your door. Should have won in 2007: Bardem all the way. Would you want to tell him any less? What could possibly top one of the greatest villains of all time? Another one of the greatest villains of all time, of course. 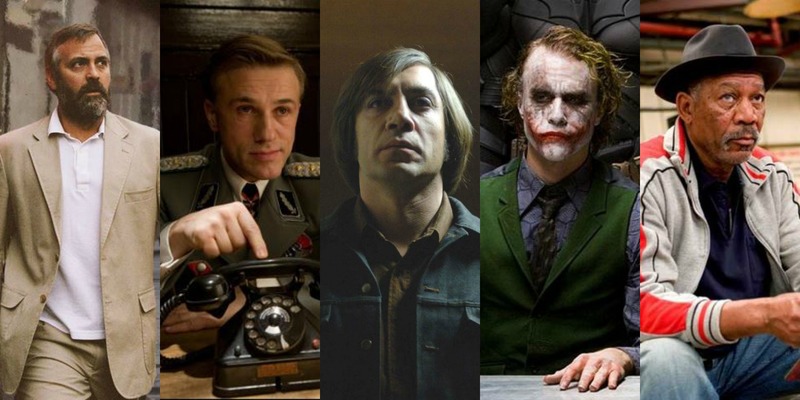 If Heath Ledger’s incarnation of the Joker teamed up with Hans Landa and Anton Chigurh to form an evil version of the Avengers, they would be unstoppable. 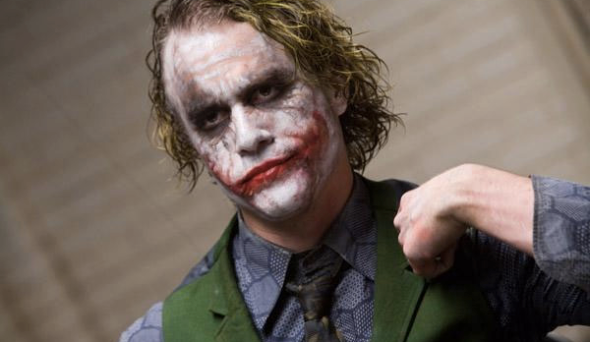 Not only did Ledger reinvent the Joker, who had devolved into a cartoon of his former menacing self many years earlier, he set the bar for comic book villains to a ridiculously unattainable level. Marvel movies don’t even really try anymore–their movies are all about the heroes because it’s hard to make a good villain. Ledger nailed everything from the appearance to the attitude to the tics. He made Joker a force to be reckoned with–Batman’s truest adversary, his polar opposite. Rarely has that kind of synergy felt so kinetic, so mesmerizing for an audience. Should have won in 2008: Ledger, Ledger, Ledger. For more, check out my Academy Awards page. Up next: Best Actress of the 2000’s.